All-on-6 is the current most effective and fastest solution in dental implantology. 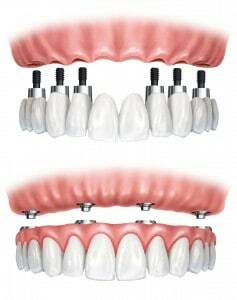 We are able to provide you with full-fledged, high-quality dental implants and dentures within only one day. Waiting for several month until full recovery is obsolete. Because this method makes it possible to even work with a low bone density, you do not only save time but are also able to use your new beautiful teeth without limitations directly after surgery. Numerous studies have proven that this reliable concept yields a very high success rate. Visit us at Beta Dental, and we will discuss every relevant aspect about the All-on-6 treatment concept with you.